This Swedish meatballs recipe is an easy weeknight dinner that is ready in about 30 minutes from the time you begin mixing the meatball mixture. It is a nice lightly flavored meatball recipe with the addition of a bit of chopped dill pickles. The pickles are the signature addition in this recipe, but if you really don’t like them, you can leave them out. You may also want to check out the suggestions in our “Did You Know” section below the recipe for other variations on this recipe. Mix the beef, bread crumbs, onion, egg and parsley. Shape into 24 meatballs. Brown the meatballs in a frying pan. Pour off the drippings. Stir in the soup, water and chopped pickles. Cover and cook over low heat for 20 minutes, stirring often. Serve on a bed of cooked egg noodles, hot rice, boiled or mashed potatoes. Celebrity chef Jamie Oliver says he likes to serve his recipe on a bed of cooked, mashed celeriac. I haven’t tried it but you may want to experiment. If you can find lingonberry jam, give it a try as a condiment for the meatballs. 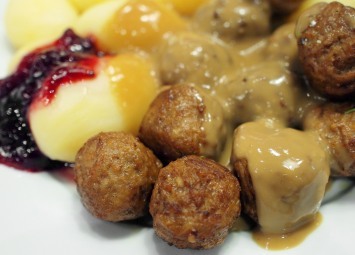 Lingonberries are traditionally served with Swedish meatballs (just like the meatballs at Ikea stores everywhere). If you can’t find lingonberry jam or preserves, cranberries will work nicely as well. You will find numerous variations of Swedish meatball sauce recipes. I have seen recipes that call for caraway, allspice, ginger and dill. If you like any of those herbs and spices, try a pinch and see if you like it in the sauce. The sauce is lovely on it’s own so don’t feel that you have to add anything at all. If you love Swedish meatballs, you will probably want to try some of our other meatball recipes too. Find them all here.